Located right at Tien river junction of Tien Giang Province, My Tho is known as a typical land of the river culture in Mekong Delta. This serene and calm land will satisfy any tourists who love peace. Follow Daily Travel to discover what My Tho has and where you should go, what you can do there. 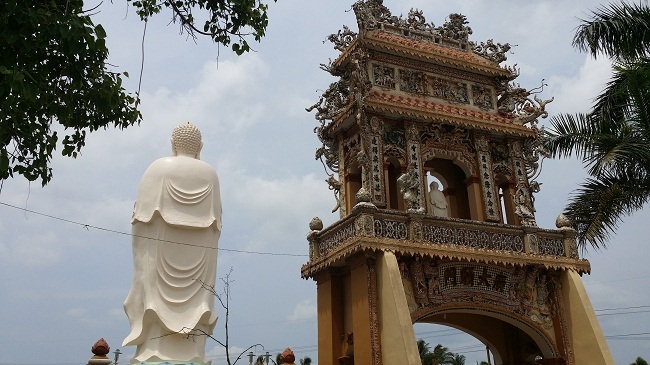 This is one of the best-known Buddhist temples in the Mekong Delta region. Located at Nguyen Trung Truc street, hamlet My An, My Phong village, My Tho city-Tien Giang. Formerly, it was a small Greenleaf hermitage set up in the early 19th century by the authority of the District – Bui Cong Dat. In 1890, the monk who presided the place-Thich Hue Dang reconstructed into the temple today and named it as Vinh Trang. Vinh Trang is considered as the largest and most ancient temple, which has a remarkable architecture in Mekong Delta region. The pagoda was designed in the “Co Lau” style and ornamented by mosaic art, which used faience and porcelain tiles made by Hue artists, to create remarkable paintings with harmonious colors and illustrate Buddha legendary and distinctive folk tales. The beautiful structure is a mixture of the well-matched European-Asian architecture, including patterns from the Renaissance period, arches of Romanesque style, French motifs, Japanese enameled tiles, the ancient style of Chinese letter characters and national letters written in Gothic style. From afar, the pagoda resembles the five-tower Angkor Temple in the concept of Wu Xing with 5 elements: metal, earth, water, fire, wood. Inside, there are many Buddha statues carved in different appearances and followed different standards. Tourists can spend time visiting the main My Tho Roman Catholic Church during the trip to My Tho. The church is currently the third church of Dioecesis Mythoensis. It was construct on 11/08/1906 by Bishop Régnier across Bourdais avenue (Hung Vuong Avenue now). By 1910, the construction was completed. The church is an architecture featured the imposing Western Europe style with 24 meters in height, 53 meters in length and 17 meters of width, one main compartment and 2 other extra ones. The main structure of this building was built in propping-up way. The dome is decorated with many sophisticated and intricate patterns. The bell tower of the church was first built beside it. By 1958, Bishop Paul Nguyen Minh Chieu relocated the bell to the higher eastern tower and then in 1995, a bell tower was built separately from the main church and remained until todays. If you want to look for something different for your trip, Dong Tam snake farm is the best answer for you. A place is known as a distinctive snake kingdom in Tien Giang. Dong Tam snake farm is located on the Tien river bank, about 9km apart from My Tho city, Tien Giang. This is one of the centers which raise and preserve many kinds of snakes, research and process medicine, treat snakebites for the locals live in Mekong Delta. Besides, the snake farm is an entertaining place for family, kids to visit and learn about the nature. Exploring the farm will bring you some interesting experiences. You may startle when suddenly seeing a cobra with its hood expanded raising its front part of the body and flattening its neck towards you. Or you may get excited with the water snakes swimming around underwater and chasing their preys. Moreover, the pythons are docile enough to be taken out of their cages and handled. You can touch, put it around your neck and take photos. It is not frightening because those pythons are really friendly and you will feel free to capture all beautiful moments with them. Located in hamlet Dong, Kim Son village, Chau Thanh commune, Tien Giang province, on the Tien river bank and 12km apart from My Tho city in the west. The site is a construction to memorize one of the greatest victories in Vietnam history of people in the South against enemies. In the centre of the relic, there is a national hero monument – Nguyen Hue – is pulling out his sword imposingly and bravely. Beside him is a soldier raising and drawing his bow and a native boating. All of that creates a harmonious layout in a model of a battleship, which describes the famous battle in the past. Under the monument is an architecture of a temple which is engraved by a copper embossment. The embossment portrays humans and flamingos which borrowed ideas from the front side of the ancient Trong Dong (Vietnamese bronze drums). The entire monument represents the spirit of patriotism, indomitable and fearless mind of the nation. 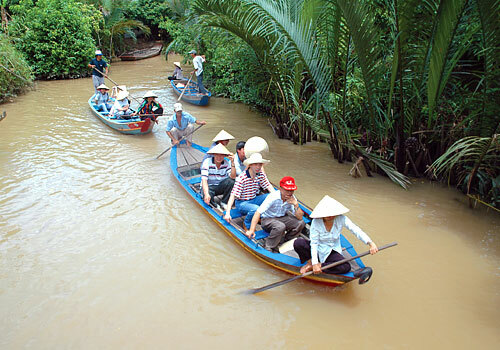 Thoi Son Island is not only an amusing recreation but also a garden tourism in Mekong Delta region. The Island is the largest one in four islands in My Tho. Vietnamese call it “Cu lao” or “Con”. There are 4 experiences that you cannot miss when travelling to Thoi Son Island: rowing boats down the canals and enjoying the views, trying some garden fruits, tasting the Western honey flavor and listening to the South traditional music “Don ca tai tu”. After being built into a tourist attraction, Thoi Son Island has been greeting many tourists from everywhere to visit, explore and approach the locals’ daily life. The common images that you can observe are: the tile house with 3 compartments, families with any generations or a restaurant with simple decoration harmonized with the nature color. Walking on a narrow road across the island, there are colorful orchards from both sides: plums, mangos, jackfruits, longans and so on with sweet aroma. When stopping by a home which has many orchards, tourists not only can take a rest, but also have a chance to pick up and taste the fruits right in the garden. It must be great, isn’t it? With those clues above, Daily Travel can be sure that tourists mind so much about selecting destinations when traveling to My Tho.